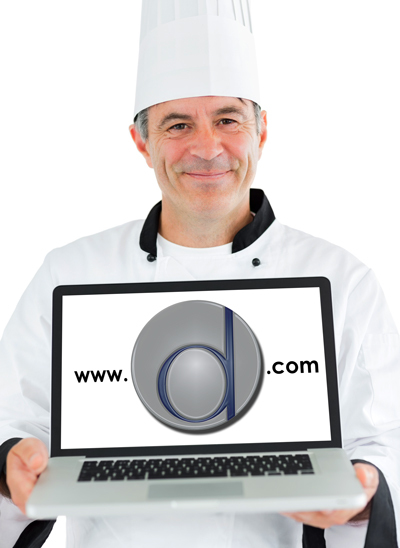 Step Into Our Kitchen – Secrets of the Debco Website Revealed! The other day I was watching a Master Chef preparing the classic French sauce, buerre blanc. She added a cup of white wine, half a cup of white vinegar and two minced shallots to a sauce pan, and then reduced it to a syrup. At the last moment she removed the pan from the heat and, taking a favourite stainless steel whisk, began to add small pieces of cold butter. She did this very carefully, making sure each piece was fully incorporated before adding the next, eventually adding a full pound of butter into the emulsification. A few seared scallops and a simple garnish later, and voila; a dish deserving of the title ‘haute cuisine’. She insisted that one must use the best of ingredients, the right tools and must always employ the proper techniques. In this manner, one could always assure the success of this simple, yet sublime, dish. It occurred to me that this philosophy holds true under most circumstances in life. For those of us in the Promotional Products industry it is all about the best of product solutions, the right application of that product for the right client, and the proper offer or pitch to bring it all together. This is our recipe for success, and it is with this foremost in our minds that we approach the evolving design of one of our most powerful and essential tools, the Debco website. But like all things – whether they be ingredient, technique or tool – what is most critical is understanding how to use the website to its best potential. Allow us to give you a little ‘peek into the cupboards’, so that you may create your own perfect recipe for success. Is the size of the drinkware important? Type in your size requirement, as in “500 ml” or “16 oz”. What about materials? “Ceramic” works. So does “cork”, for that matter. Type in “football” for an NFL or CFL themed event. Or “non woven” or “eco” for ecologically sensitive campaign. You’ll be surprised at just how powerful our search engine can be! Is price point the all-important factor? Use the price search boxes. Type in the quantity you need, and then the price range from low to high. By far and away our most popular page on the website, and for good reason. Here products are grouped into logical, oft-used categories. You’d expect to find “Totes” and “Drinkware”, but did you know you’ll also find products suitable for a “Direct Mail” campaign? How about exploring some of our special collections, like the Amber, Borlack or Vision Collections. Have a VIP client that demands only the best in products and packaging, perhaps for a special employee incentive program? Try our Black Label Collection; premium gift-sets in elegant packaging. Once you’ve zeroed in on your product you’ll find that there is a wealth of information available for it. Each comes with its own detailed product description, including product dimensions and available imprint areas. Clicking on the product picture will bring up a larger image for you to view, but if you require a hi-res version (300 dpi, suitable for any digital or print project) it is available under the “Imprint List” and “No Imprint” tabs, at the end of the pricing grid. The “Decorating Info” tab will feature all of the options available, including the essential details like set-up and run charges. Of particular note to those interested in our Debossing option is the “Calculate Debossing Charge” function, which will quickly and easily calculate your Die Charge. You can quickly check stock levels on the “Check Stock” tab, and find out how quickly you can get it in the “Delivery” tab. Of special note to those interested in our NOW! and Fast Forward service are the icons beneath the product description. 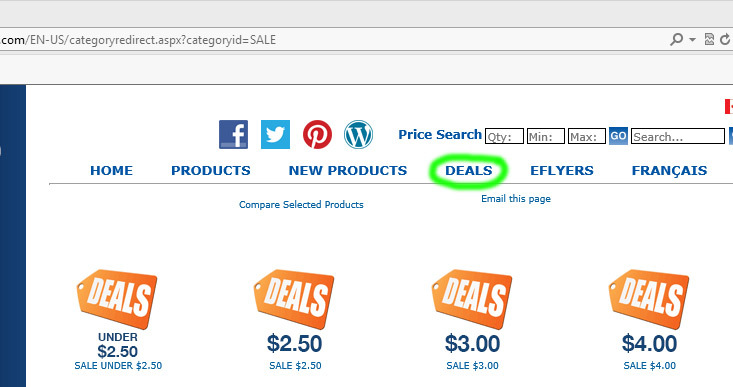 Hovering over these buttons will bring up the maximum quantities available for rush delivery. It has never been more important than today to find ways to help your clients stretch their promotional buck to the absolute limit. Our “Deals” menu can help you to do just that. Here you will find a plethora of special opportunities to take advantage of, with products on final runs. The quantities are limited and will not be restocked, so once these are gone they are gone forever, but because of this there are some real gems available here. And these are not hidden gems, either. 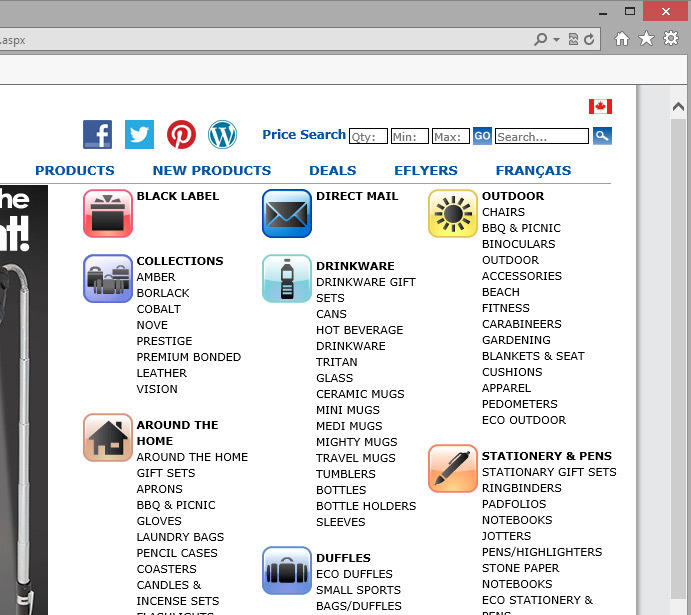 You’ll find them in well-organized categories that will make finding your bargain a breeze! At Debco we know that finding the right deal can be an exhausting process, so we want to do all we can to help. We take the guesswork out of promotional buying by keeping an eye on the competition 24/7, assuring that you will always find the best possible price without all the running around. Market Price Check is regularly updated, and should be bookmarked for instant access. Once you’ve found your products there are additional tools available to help you organize them. The “Email this page” option will allow you to easily do just that, while the “Printer-Friendly” option removes all unnecessary decoration to make hard copies clean and compact. We also provide “Recently Viewed” and “Related” sections, to help you not only remember where you’ve been, but also where you might want to head in the future! One of the most powerful sales tools you can find on the website is our “Virtuals” option. 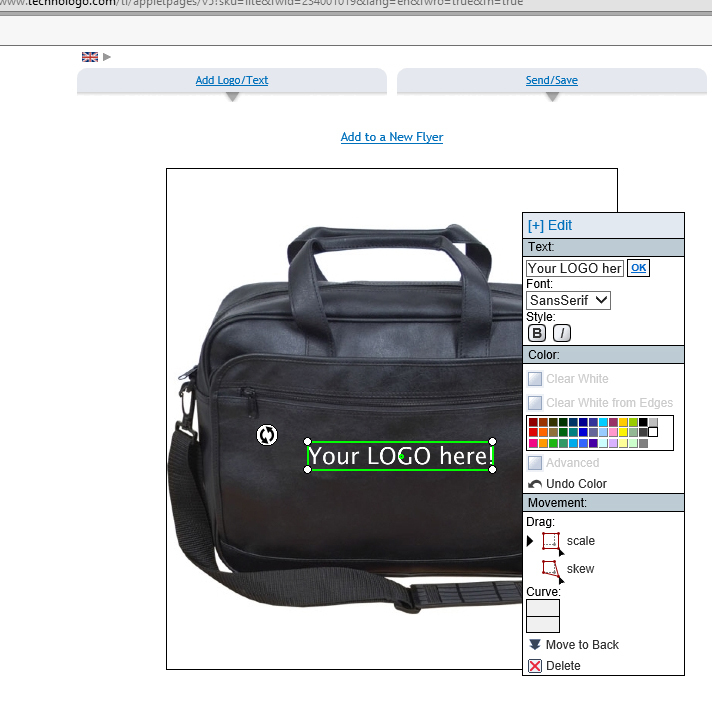 This allows you to take a high-resolution image of a product and add the logo or text of your choosing. Now you can see what the final product might look like in only a few minutes. Clicking on the “Virtuals” link on the “Imprint” tab of your product brings up a pop-up of the virtuals engine. Logos are supported in a wide range of file types, including JPG, GIF, PNG, TIF or PDF. 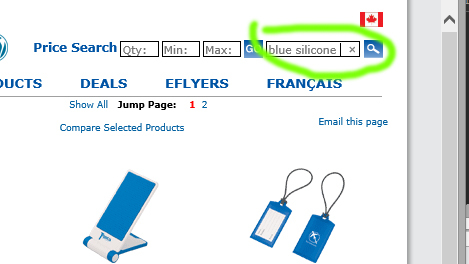 The Add Text option is flexible and intuitive, giving you colour, font, size and placement options (by default sized to the standard imprint location). You may even alter the perspective of the logo or text, if you desire. Save it, or send it along. Add it to a flyer or a portfolio (with a registered account). It’s all there! Much of the functionality of the website is there, but in a version that fits snugly into your pocket. Consider it Debco on the go! If you’ve been in the Promotional Products industry for any length of time you have come to know the ubiquitous product flyer only too well. Whether in print or electronic form, it’s the established medium that fits easily into everyone’s comfort zone. We love our flyers here at Debco, and love to share them even more. Most of these flyers are available to you in an end-user friendly format, ready for personalizing with your logo. Make sure you’re signed up to our e-flyer program so that you know the moment we have a new flyer available! Need to make your point to a client? Some inspiration? A unique product idea? Some insider information? We author our blogs with your needs, wants and interests in mind. Whether we’re waxing philosophic, extoling the virtues of a new product line, or trying to help bring perspective to the ever-changing Promotional Products industry, you can be sure there will be something valuable to take away from each one. What do you do when a client asks a sticky question about ecological sustainability? No problem! You have a wealth of Eco articles at your fingertips in our “Articles” section. In fact, there is so much information here that you can easily build an entire Green campaign, particularly when you remember that we feature over three hundred Eco friendly products! 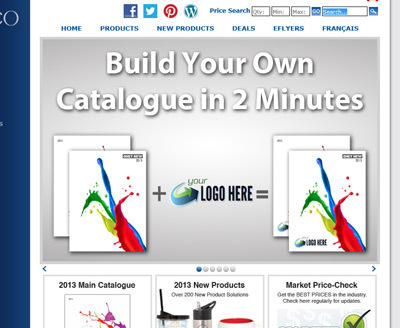 Want to create your very own 300+ page catalogue in just a couple of minutes? Click the link on the main page of the website and you can do just last. Sign up for an account, enter your contact info, upload you logo and you’re done. Your logo on the cover, with hundreds of beautifully laid out product solutions behind it. What could be easier? The first phone call was made over 130 years ago. The first computerized fax board was produced in 1985. By the mid-nineties email had become an essential business tool. Now, with the new century being already more than a decade old, social media has emerged as the newest mass communication tool. Is it as revolutionary? Perhaps not. But one thing is for sure; there are more than a few multi-billion dollar companies – from internet giants to telecommunication multinationals – who are not only pushing social media as an essential tool, but have mortgaged their future upon its success. What other reason is there to buy a ‘smartphone’, really? Like it or loath it, Social Media has done a fantastic job of not only making itself relevant, but to many millions of people and businesses, absolutely essential. Why? Because Social Media is all about instant networking. Facebook, Twitter, et al. have built systems in which billions of people can be connected in an instant and they have provided that system to people and businesses for free. Most of the really hard work is already done. People are asking to be engaged, they are inviting content delivery. All you have to do is provide something interesting. 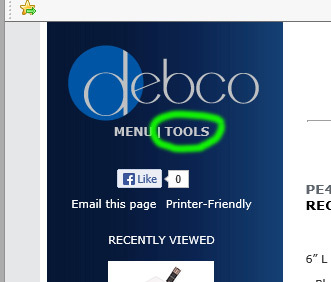 At Debco we strive to provide much of that interesting content for you. Much of the time we find that our partners get huge wins simply from sharing the content we have created for them. Yes, it can be that easy. You need not become a Social Media guru for it to be useful. The lion-share of our Facebook ‘Fans’ receive content from only a handful of ‘Fan Pages’. 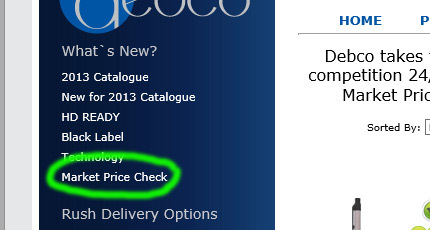 It’s the fastest possible way we can inform people of the latest happenings at Debco, including time- and quantity-limited deals. Proof? Our Facebook deals have moved as many as 100,000 units in a single month. This entry was posted in Marketing and tagged Advertising Specialty, Debco website features, helpful tips, Marketing, product solutions, Promo, promotional gifts, Promotional Product Supplier, Promotional Products, Swag, Technology Accessories, Website features by Debco. Bookmark the permalink.